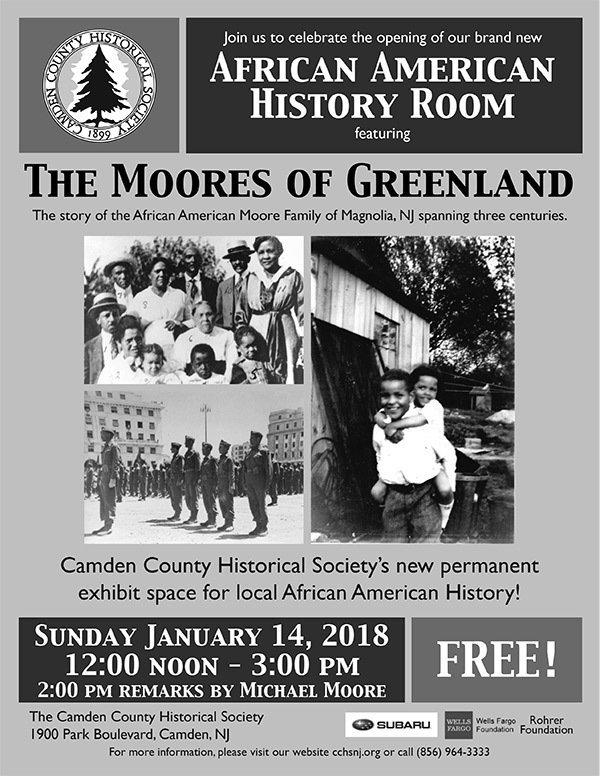 In partnership with the Lawnside Historical Society, the first rotating exhibit in the African American History Room will feature the “Moores of Greenland,” which tells the story of the African American Moore family spanning three centuries. As a free person in the 1790s, Robert Moore moved from Burlington County, where he was previously enslaved, to the region once known as Greenland (present day Magnolia). From this area, he began a family that created a legacy of community involvement, public health services, and military service spanning more than 225 years. Members of the Moore family were a part of the early development of Lawnside and Magnolia, offered medical checkups and services to underserved communities, and risked their lives protecting our country through the military and National Guard. Descendant Michael Moore will share remarks at 2pm. The Camden County Historical Society’s Pomona Hall (1726) was a slave plantation until 1795 and is now situated in a primarily African American community. The new African American History Room enables the Society to tell a more balanced story beyond the affluent Quaker lifestyle portrayed in Pomona Hall. In 2016, the Camden County Historical Society changed its mission from being strictly about history to adding the focus of cultural enrichment. This year, Society will offer four separate programs focused on the local heritage and culture of African Americans, Latinos, Asian Americans and Native Americans. Overall, the Society is seeking to tell the stories of the rich history and culture of all racial and ethnic groups and not just European Americans. Created from the bottom floor of what was formerly the caretaker’s house for Pomona Hall, the African American History Room is part of a larger $120,000 capital project funded by the City of Camden CDBG program and Camden County Historic Preservation Program which has also transformed our auditorium into the Cultural Heritage Center & Gallery and provided a new ADA accessible entrance. The exhibit is funded by the Rohrer Foundation, Subaru Foundation, and the Wells Fargo Foundation. Special thanks to Linda Shockley and Sandy Levins for their guidance and perseverance. The Open House on Sunday, January 14th is free and open to the public. During regular operating hours, admission to the museum is $5 for non-members and free for members. The exhibit will be open during our normal operating hours through the rest of 2018. The Camden County Historical Society is located at 1900 Park Boulevard, Camden NJ 08103, and is regularly open Wednesday to Friday from 10am to 4:30pm and Sunday 12-3pm. For more information, please call 856-964-3333, email admin@cchsnj.org, or visit our website at www.cchsnj.org.